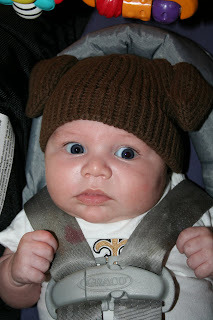 (1) Cheering for the Saints! My brother and I have always been fans and watched them every Sunday...we're not the Debbie Downers every year (like most "new" Saints fans)! Kimber has decided he would be a true fan as well! Look how cute he is! 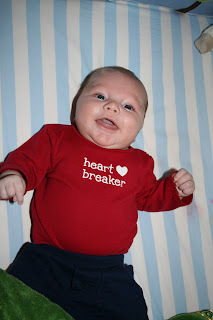 (2) Smiling for mama and making her heart skip a beat! (3) Getting into a real exercise routine! Addie Lee saw her daddy doing this and thought it was a good idea! 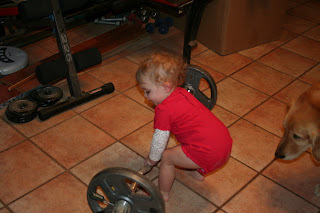 She's probably going to be in the next junior (or baby) Olympics! Watch for her! I think her stance is just what they look for at the Olympics! However, Jake wasn't so sure about this! He thinks the only exercise you should do is chasing sticks! (4) Having style even when you're just hanging out at home! 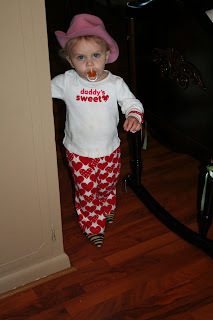 Addie Lee is pimpin the pink cowboy hat (which she must wear everyday), an orange pie in her mouth, Valentine clothes, and we cannot forget mama's tiger stripe high heels! Now if she's not a lady in training, you won't find one! She is great at walking in heels and balncing the cowboy hat on her head. Everyday when I get home from work and take off my heels she puts them on. Or she'll go to my closet and get some to wear around the house. She is very impressive at walking in them!